These two sets of parameters control the fluid behavior of particles when Fluid Motion is enabled. 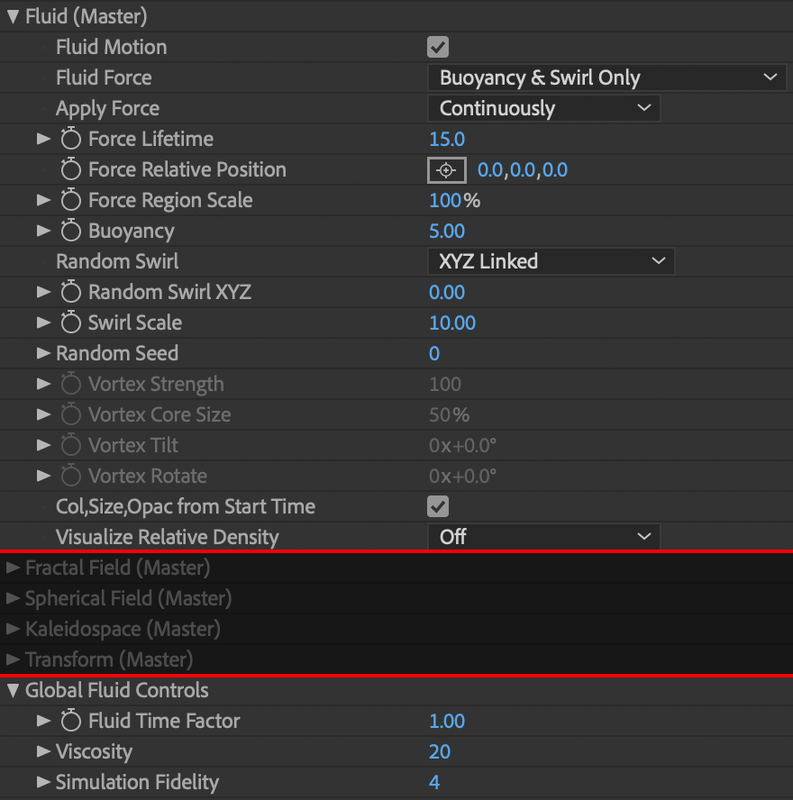 If you're looking to add additional fluid forms, performance will be much faster if you work within one instance of Form. Adding fluids on separate Form instances on separate layers will increase render times dramatically. When working with OBJ forms, note that animated OBJ Sequences are not supported when working with fluid dynamics. When Fluid Motion is enabled, the base form position cannot be animated. Toggles whether the fluid forces are applied to your particle form. 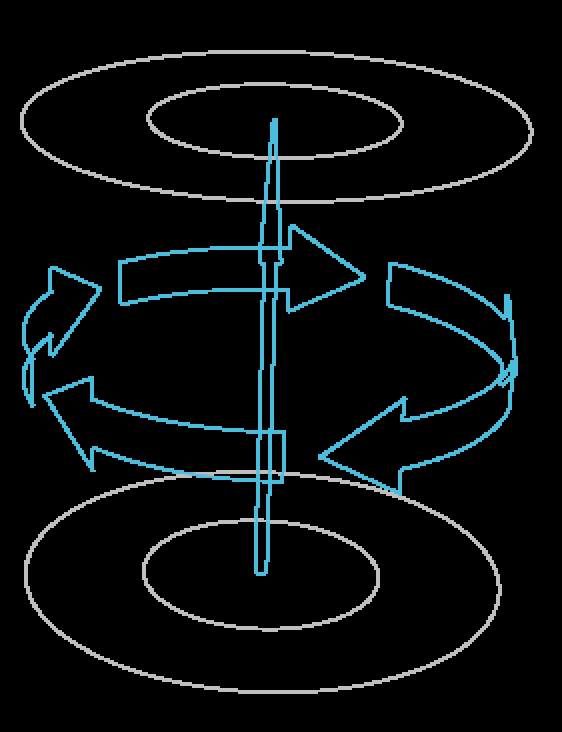 Buoyancy & Swirl Only: Particles receive an upward force akin to buoyancy, as well as a random force applied individually or jointly across all three axis. Vortex Ring: Particles receive an upward buoyant force, which is centered in a ring comprised of vortex forces that will propel particles in a determined direction. Vortex Tube: Particles receive an upward buoyant force while surrounded by a single vortex force, spinning particles in a cylindrical manner. Determines if the force dictated above is applied Continuously, or only once (At Start) of the effect. Defines the timeframe in which the fluid forces are applied to the particle form. Lower values equal a shorter timeframe and faster motion, higher values create slower forces and slower motion. If Apply Force is set to Continuously, this determines when the forces are regenerated. A set of X, Y, Z coordinates which determine where in relation to the base form the forces defined above are applied to the particles. 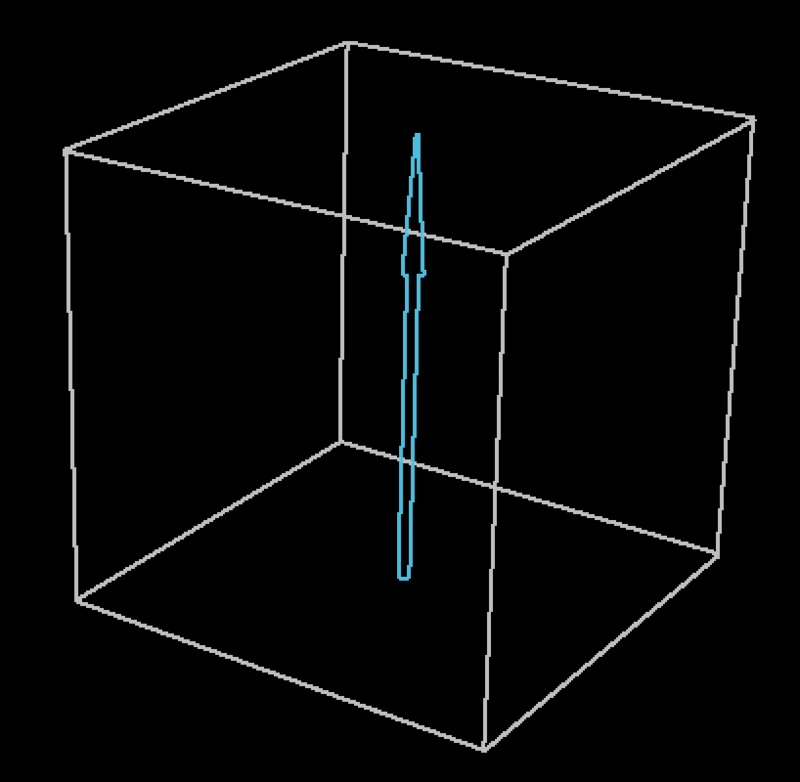 Determines the size of the area in which fluid forces are generated. Defines how much upward or downward force is applied to the particles. This controls how turbulent swirling forces are applied along the X, Y, and Z axis of the particles. The higher the number, the stronger the forces and the further the particles travel from their original position. Adjust the complexity of the swirl patterns; low values provide large swirls, while higher values provide smaller swirls. Adjusts the integer used to create a random effect. Changing this will help give one fluid particle effect a slight variation from any others you may have in your composition. Controls the speed of the vortex is spinning, which increases and decreases the strength of its force on the fluid particles, as well as the direction. Adjusts the diameter of the vortex forces used to spin the fluid particles. Tilts the vortex forces along the axis of the buoyancy force. 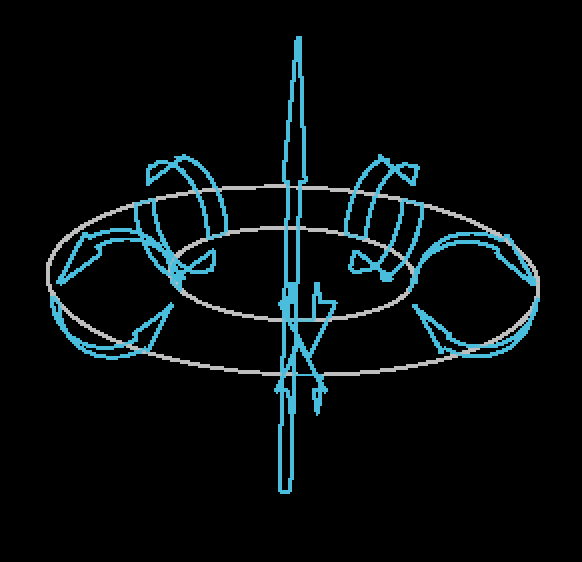 Rotates the vortex forces around the axis of the buoyancy force. Note that this will only have a noticeable effect when the vortex tilt has been adjusted. Off: The default setting. Particle appearance is not affected. Opacity: Changing the amount of surrounding particles or the strength of fluid forces around it will affect a particle’s opacity. Increased levels make a particle more opaque, decreased levels make it more transparent. Brightness: Changing the amount of surrounding particles or the strength of fluid forces around it will affect a particle’s brightness. Increased levels make a particle brighter, decreased levels make it more darker. These controls affect any and all particle systems within your Form effect that are using the Fluid physics model. Controls the timeframe in which the forces are applied to the fluid particles. Lower values means the forces are applied more slowly, while higher values means they're applied faster. Note that this number increases exponentially, so if you're looking for finer controls, consider adjusting this value by the tenths-- a shortcut for this is holding down the Alt key while scrubbing the parameter, or you can manually enter in your values. Controls the complexity of the pattern of forces applied to fluid particles; higher values equal a more granular, micro interactions, while lower values create broader, macro interactions. Low fidelity (left) versus high fidelity (right), notice the force affecting finer areas of the form on the right than they are on the left.